Well… now that Mr. Steven Samblis has 3 reverse splits under his belt for his public company PNCH(D), there is now a pattern based on actual historical data that can be used to forecast possible future reverse splits. Take a look at the below chart (click to enlarge). 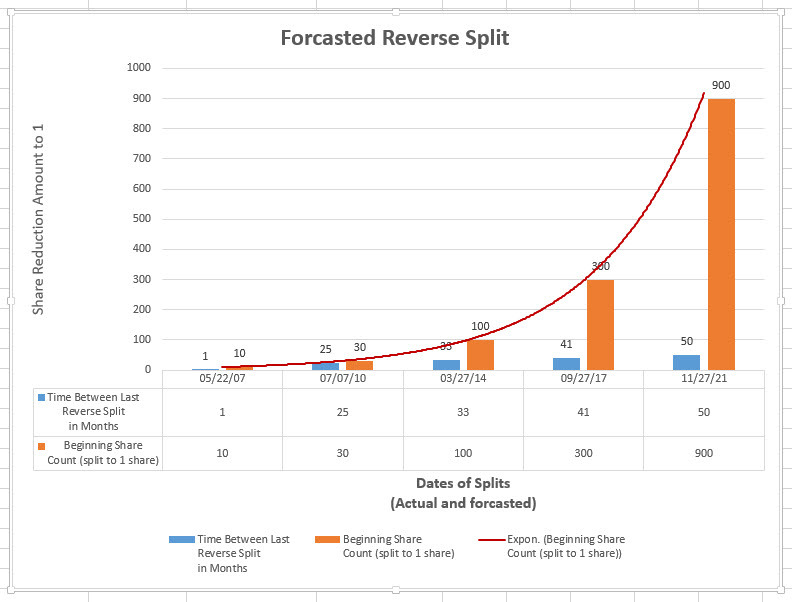 This chart could represent a fairly accurate forecast of when, and how large, a future reverse split may be. This chart utilizes the actual historical data, and projects out possible dates and share reductions for the future. Now of course Mr. Samblis will dispute this data, and most likely dispute the entire concept of another reverse split… but how did his assertions about not going to do a reverse split regarding the most recent reverse split work out ? Numerous post after post assuring the investors he would not do a reverse split, even going so far as to call those who would suggest such bashers, and liars. 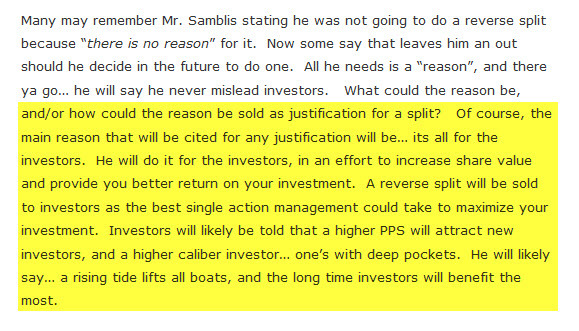 If Mr. Samblis’s credibility was questionable before the 3/27/14 reverse split… there is certainly NO question now. For over a year this company could not get anyone to buy the stock over a penny (or much over .0003)… what now makes this company worth 2-3 cents a share? Given the history of reverse splits, and the overwhelming likelihood of another one… WHO is going to take a chance on this company, and more importantly… a CEO with less than zero credibility. Even if the company were to have revenue (which it hasn’t for quite some time now), its unlikely investors would take a chance on it with so many other companies out there that actually have revenue and some are even profitable. That coupled with factual data demonstrating the CEO has been reckless with the truth on more than one occasion, about serious issues such as not going to do a reverse split. How could anyone trust ANYTHING Mr. Samblis says… or, puts in writing for that matter. And… Mr. Samblis has not even had the intestinal fortitude to face his investors over the reverse split yet. Come on Mr. Samblis… face the investors ! Reverse split – its official ! So… what should investors expect now. Well, we think that what we said back in early October of 2013 would be the best bet. Below is an excerpt from that post, however its worth reading the entire post here. So… many expect Mr. Samblis will go into hiding, and who could blame him, but we believe Mr. Samblis’s arrogance will move him to make an appearance on the message boards, or in a press release, and try to sell the reverse split as the best thing for investors. He may believe that the best thing for the company is to drive off all current investors and troll for some new ones. That may have been a useful tactic back in the day, but in today’s time, with such easy access to historical information via the internet, any new potential investor will quickly find that the history of Mr. Samblis’s previous actions with regard investing in his company, is readily available with a few clicks of their mouse. Today… there is no place to hide. Your history WILL be found ! So… with the PPS not being able to go much lower, a reverse split will now allow Mr. Samblis to sell more stock because now it will have some room to fall some more before it reaches .0001 again. What’s that you say… he has less of it to sell now because the reverse split reduced the number of HIS shares also? Remember… all he has to do is fire up the printing press and make some more shares, and get back on the message boards and pump, pump, pump. Pretty sweet deal he has going there don’t you think ? Look for the symbol change soon now that he has some breathing room to sell more shares to pay for it. Unfortunately, it appears when an investor asks a valid, but unflattering, question about the company or the CEO… they are labeled a “basher”. When did asking a valid question make a poster a basher ? Labeling a poster who asks a very valid question, and/or giving their unflattering opinion about the company or CEO a basher, is a tactic of the avid supporters of the company to discredit that poster. Its a very effective tactic (if you let it) to silence the poster. Its a “shoot the messenger” mentality for those who can not argue the merits of the issue being discussed. If the poster’s question or comment is valid, even though at times maybe crudely stated, instead of supporting a response with alternative facts, the responding poster attacks the questioner personally in an attempt to convince others that because the questioning poster is somehow flawed personally… the question has no validity. Many have seen this tactic utilized by Mr. Samblis also. We say nonsense ! Using the tactic of attempting to discredit the messenger is tantamount to playing the race card in a discussion about political issues. How many times have you seen those that would speak out in opposition of the policies of the president be labeled a racist. The theory is… if you disagree with the president, then you must be a racist. We say nonsense ! Placing a label on someone who disagrees with your position is an effective tactic (if you let it) at changing the subject. The discussion at that point is not about the issue at hand, but the NEW issue of creditability of the questioner instead of the issue. Don’t let yourself fall into this trap. If you let the attempt to divert the discussion to unrelated issues like labeling, you fall prey to their trap. They attempt to trap you because they are unable to argue the merits of the issue. They have no defense, perhaps because the issue is indefensible, so therefore they attack the messenger instead of the message. Pathetic and inexcusable in our opinion. An additional tactic to quiet unflattering questions and/or opinions is the use of censorship. Censorship is also a very effective tactic used by those who can not debate the issues and seek to simply make the issue invisible, or so they think. LieHub is a prime example of the practice of censorship. Anyone who has spent more than a few minutes on the site will realize pro-PNCH comments are frequently deleted. Those that support PNCH find this practice unfair and unacceptable. Deleting an opposing view leaves the reader with an unrealistic, and perhaps an invalid view of the company. The Investors Hangout message board is an example of the opposite of LieHub. Investors Hangout frequently deletes negative comments about PNCH. We ask… if the practice is wrong on LieHub… why is it not wrong on Investors Hangout? Deleting posts, it could be argued, is a tactic by those that have the power to delete postings to influence what others see. The deleted post is likely not flattering to their position or cause… so they delete it so that it can not become a discussion that may develop into something they don’t want brought to light. Here again, its easier (and perhaps equally as effective as changing the subject by labeling) to divert the subject matter because they likely have no supporting information to debate the issue. By reading those first 2 posts it would appear that attacking another poster will NOT be tolerated (and summarily deleted)… UNLESS (it would appear) the attack is in support of PNCH. Most will agree… this example is obviously hypocrisy personified. As we write this post, the personal attack seen above remains posted. Folks… if you have a question or an opinion, don’t let the opposition curtail your voicing such. Make your point, support such with facts or justification, and don’t let others divert your attention off the subject matter by labeling you, or censoring you. There are far more outlets to express your opinion than message boards. AND… if you feel the need to attack the messenger, then you likely have an unsupportable position on the subject, or, you don’t have enough knowledge about the issue to respond. Do your homework, then respond. Attacking the messenger only shows that you are unable to debate the issue effectively. If you see a response that attacks the messenger, you know the responder has no ability to defend what they are attempting to defend. And the same goes for those that have the power to delete posts… ask yourself…are you abusing your privilege as a moderator in an attempt to force your own agenda onto other readers? If so… shame on you ! Its good to see Mr. Samblis actively promoting the company, and we certainly endorse such, however… are message boards the prudent place for such promotion? How effective can that be? If this is Mr. Samblis’s idea of active promotion (i.e. advertising), it seems to fall in line with many of his past business decisions. Past business decisions that have his company currently trading at .0002 as we write this. When looking at at the history of this company, Mr. Samblis has been CEO for over 8 years… and his company is currently trading at .0002. That does not instill confidence with investors that somehow Mr. Samblis can perform a miracle and turn this company around, when in over 8 years he has not been able to turn in a better current performance than .0002. Granted about 2 years ago the PPS hit around .05, however that was short-lived and would be considered by many as an anomaly. Is it possible someone could have done a worse job at leading this company ??? Sure, its possible the company could be bankrupt and out of business, however when the CEO of a company can leverage investor money to keep the company afloat, and somehow investors keep investing, why would any CEO bankrupt the company and voluntary relinquish the flow of available cash. As long as there are gullible investors willing to give the CEO money, it would be a new level of stupidity for a CEO to cease operations under those circumstances. Now, we mentioned above that Mr. Samblis also answered some questions during his visit to the message boards. Not many, but as an example, a poster asked “steve who owns imagine tv.?“. Mr. Samblis responded: “Currently Imagine is a separate entity with IC Places supplying all the content. VU is making 50% of the ad revenues on FilmOn on its channel.”. Now, we suspect the question had its roots in wanting more information about the relationship between Mr. Samblis’s newest venture Imagine TV, and the public company PNCH that people have invested in. Like was there any PNCH funds used to create the Imagine TV venture, and are any of its expenses being run through the public company? Also, where would any revenue be recorded if Imagine TV were to have any sales of products or advertising revenue? In another example a poster point-blank asks the question… “How is Imaginetv associated with IC Places?”. In Mr. Samblis’s classic evasive response mode he replies… “We will talk about this shortly. I am not prepared to go over everything right now in regards to this.”. Classic Samblis response ! So, interpreting Mr. Samblis’s answer literally, it appears IC Places (which is part of the public company) encounters the expenses of producing content used for Imagine TV, yet because Imagine TV is not a part of the public company PNCH… any revenue generated by said content stays with Mr. Samblis’s personal accounts. If you are an investor in PNCH… how does that sit with you ? Of course all of this is concluded speculation because Mr. Samblis has not been forthcoming explaining the relationships between all of the different entities he is involved with. Why ??? Anything that is shrouded in secrecy is highly suspect to be questionable, or worse. Investors have been asking for clarification repeatedly, however all they get (if they get anything) is misleading and evasive answers like the above. So folks… with little or no information, and with what information that is available being evasive and misleading, and, with a track record of running the company for over 8 years and currently having a PPS of .0002… what are investors to think of this sudden push to advertise his company on message boards? Well, perhaps this post below sums it up for most (click to enlarge). The poster was, and had been, a long time supported of Mr. Samblis and his company. We just wonder how many others are out there with the same sentiments about Mr. Samblis and the company. ALSO… how many new investors will be willing to invest in this company given all that has transpired to date, and the secrecy that still surrounds much, if not all, of the actions of Mr. Samblis. PNCH investors must feel like mushrooms… kept in the dark, and fed horse manure.